Have you ever wondered where your dreams come from? You might be surprised to know that they are controlled in a hidden fold in your brain between the possible and the impossible ... a place called Foo. Without Foo, humans could no longer dream. They could no longer hope. But now, the very existence of Foo is threatened, and 15-year-old Leven is the only one with the power to save it from the evil Sabine. Secretly watched over from birth by a funny, 12 inch tall, furry little creature named Clover, Leven is suddenly pulled from the cruel family in which he has grown up and given the charge to save Foo. Will Leven be able to overcome Sabine's terrible evil that stands in his way and threatens to destroy him? With his friend, Winter, will they be able to find Geth, the wise, but displaced king of Foo in time? Will they be able to locate the crucial gateway to Foo? Come along on this wild fantasy adventure for the ride of your life! This story will get your heart racing and your funny bone vibrating! Grab a friend and together explore your imagination and open up this new world of Foo! 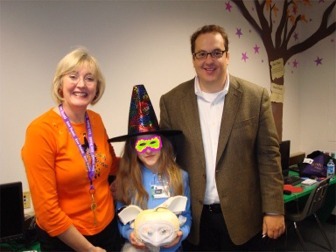 Author Obert Skye, seen here with Librarian Marilyn Watson, visited Cimarron Elementary in Katy, Texas! "It was a terrific experience to have Obert Skye at our school. He was a super motivational speaker. Kids (and teachers) loved him." An enthusiastic fan delighted him with a "Clover Pumpkin" for their school's Book Character Pumpkin Extravaganza! You can purchase the Kids' Wings 26-page Kids' Wings Unit for Leven Thumps and the Gateway to Foo by Obert Skye NOW for immediate download for only $9.95! Sharable within your school! Click Here. A 26-Page Unit for Leven Thumps and the Gateway to Foo is available in download and is a part of a collection of 21 units in The Ripple Effect. help to keep our website doors open. Texas Bluebonnet Award is a service mark of the Texas Library Association, which is in no way affiliated with Kids' Wings or Suzy Red. 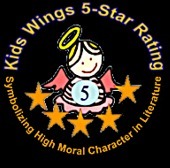 Use of the Texas Bluebonnet Award mark in Kids' Wings web pages and/or materials does not imply any endorsement of any kind on behalf of the Texas Library Association. The Texas Bluebonnet Book Master List was selected by the Texas Bluebonnet Award Committee of the Texas Library Association. The book list presented here is an altered presentation of the Texas Bluebonnet Award Master List and is not endorsed in any way by the Texas Library Association. The complete MasterList may be found at www.txla.org.